Peroxisomes are single-membrane bound intracellular organelles that can be found in organisms across the tree of eukaryotes, and thus are likely to derive from an ancestral peroxisome in the last eukaryotic common ancestor (LECA). Yet, peroxisomes in different lineages can present a large diversity in terms of their metabolic capabilities, which reflects a highly variable proteomic content. Theories on the evolutionary origin of peroxisomes have shifted in the last decades from scenarios involving an endosymbiotic origin, similar to those of mitochondria and plastids, towards hypotheses purporting an endogenous origin from within the endomembrane system. 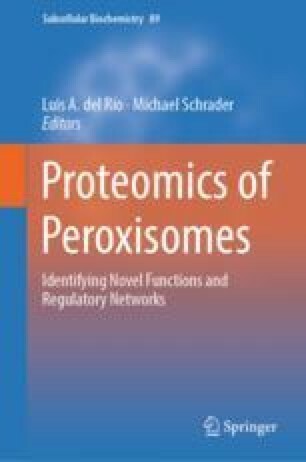 The peroxisomal proteome is highly dynamic in evolutionary terms, and can evolve via differential loss and gain of proteins, as well as via relocalization of proteins from and to other sub-cellular compartments. Here, I review current knowledge and discussions on the diversity, origin, and evolution of the peroxisomal proteome. TG acknowledges support of the Spanish Ministry of Economy and Competitiveness grants, ‘Centro de Excelencia Severo Ochoa 2013-2017’ SEV-2012-0208, and BFU2015-67107 cofounded by European Regional Development Fund (ERDF); from the CERCA Programme/Generalitat de Catalunya; from the Catalan Research Agency (AGAUR) SGR857, and grants from the European Union’s Horizon 2020 research and innovation programme under the grant agreement ERC-2016-724173 and the Marie Sklodowska-Curie grant agreement No H2020-MSCA-ITN-642095.